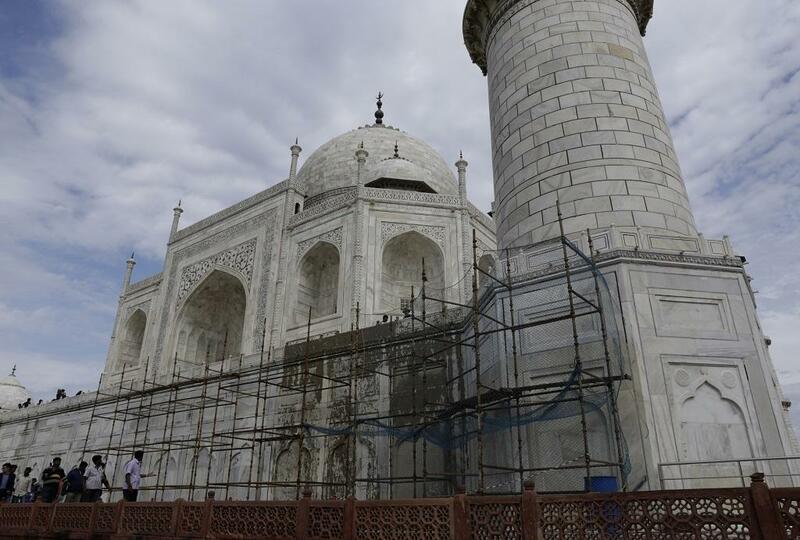 It’s not the first time this happened and it won’t be the last: The Supreme Court blasted the Centre, Uttar Pradesh government and the Archaeological Survey of India for failing to preserve the Taj Mahal. Let’s back track a little and take a look at the factors that threaten the seventh wonder of the world, how authorities’ knee-jerk reaction to Taj Mahal’s discolouration affected petha-making units and a timeline of steps taken or planned to preserve the historic monument. Mineral impurities present in the marble get oxidised and create brown stains. Rains also have a weathering effect on the marble and have been noticed to cause chipping and cracking. The iron dowels used to fix the marble slabs on the building get rusted and the rust flows down with rain, getting deposited on the marble. 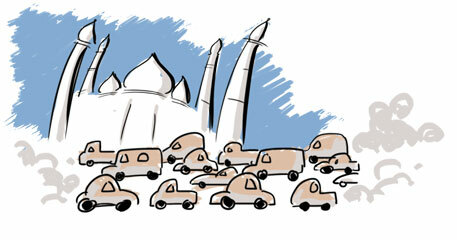 The biggest threat to the Taj is the unregulated number of visitors, which on some days is over 50,000. Constant treading wears down the marble floors. Presence of visitors increases humidity inside the building and the grease from their palms causes deposition of grime on the walls. 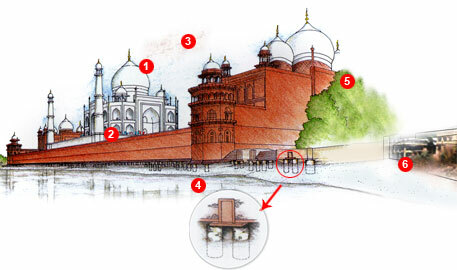 The greater threat is to the red sandstone used in the Mehman Khana and the mosque on either side of the Taj. Unlike marble which is hard, red sandstone is porous. The weathering of the Mehman Khana is very obvious. A recent Indo-US study found that dust and carbon-containing particles are settling on the Taj Mahal and causing discolouration. Earlier, the Mathura Refinery and small industries were seen as the cause for the "yellowing" of the monument, prompting the Supreme Court to order use of cleaner gas fuel by these units. Media reports in 2011 suggested the receding Yamuna is weakening the sal wood (Shorea robusta) in the foundation of the Taj Mahal which needs constant moisture to prevent it from cracking. Taj's foundation, built of brick, watertight mortar and wood, is supported by circular wells dug in the river bank to give it stability. 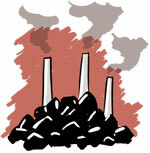 The low flow in the river and the high pollution are also major causes of concern. ASI, however, says it has no evidence that wood has been used in the foundation. A large number of trees have been felled in Agra in recent years to build roads and other infrastructure. Agra lies in a semi-arid zone, near the desert state of Rajasthan, and experiences very hot summers when temperatures touch 49C. Hot dusty winds have an abrasive effect on the marble. 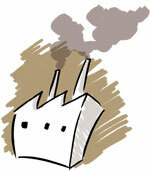 Increasing green cover and water bodies is one way of curbing dust pollution. Taj Heritage Corridor-the riverfront project of former Uttar Pradesh chief minister Mayawati-comprising food plazas and malls, planned between the Agra Fort and the Taj was shelved on Supreme Court's orders as it could have been a threat to the monument. Sand accumulated in the reclaimed river bed can erode the marble surface during sand storms, says ASI. The site is yet to be turned into a green belt as directed by the court. Honeybees and tourists hovering in petha shops is a common sight across the bazaars of Agra. After Taj Mahal, Agra is famous for petha, candied ash gourd, sold dry, in syrup and other forms. But these juicy delights are now facing a threat. 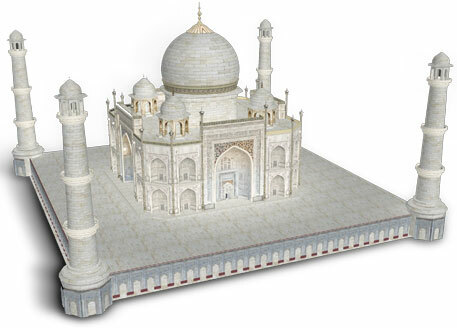 When a recent study pointed to dust and carbonaceous particles discolouring the marble veneer of the Taj, the authorities had a knee-jerk reaction. This has been happening since three years and the Taj still turned green and brown from its earlier shade yellow. They asked petha-making units within an area spread over 10,400 sq km around the Taj to either switch from using coal to LPG (liquefied petroleum gas) or shut shop, without ensuring proper alternatives. 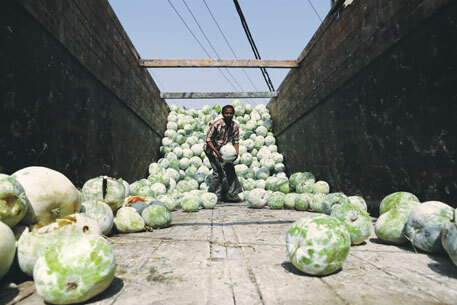 Nearly 1,000 petha-making units exist in Taj Trapezium Zone, according to the data with the Agra Development Authority (ADA) for 2011-12, the last time it estimated the number. 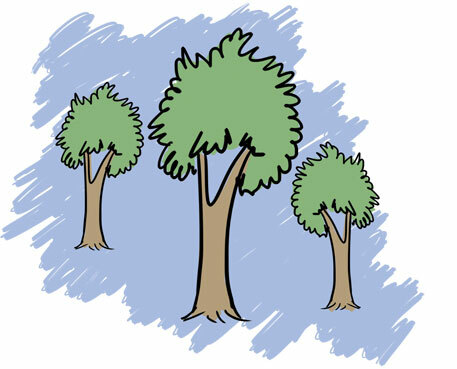 According to a December 2013 report by ADA, titled The Comprehensive Environmental Management Plan for Taj Trapezium Zone Area, the average wood consumption in each petha unit is five kg per day, whereas coal used is about four kg per hour. Thus, the total daily consumption of all the petha units is estimated to be 500 kg wood and 4.7 tonnes of coal, which emit nearly 7.5 tonnes of CO2 a day. This is equivalent to the CO2 emission by three diesel-run SUVs in a month. Many workers have already lost their jobs. Shankar Lal, 46, had worked in the industry for 22 years. “I was earning Rs 9,000 a month till two months ago,” he says. Now Lal is working as a daily wage labourer in the fields of Khanda village, earning a maximum of Rs 2,000 a month. 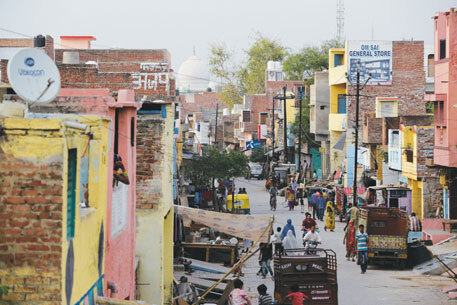 Over 800 people have been rendered jobless in the village, which is just 40 km from the Agra city. Raju Yadav, 22, and his father Bachchu Singh, 52, were also rendered unemployed by the state government’s recent actions. They were working in a small petha unit at Noori Darwaza, the hub of petha making in the city. “We own two to three bigha of land (less than half a hectare). That is not sufficient for a family of six,” says Yadav. Singh had been making the popular sweet of Agra for three decades, having risen from being a helper to a kaarigar (chief). He does not know where to look for a job now. Lal, Yadav and Singh worked in small units that produced 400-500 kg pethas a day, usually employing 15 workers. When asked about loss of livelihood caused by the crackdown, ADA officials denied it and said they were merely following the 1996 judgement of the Supreme Court which barred burning coal in a 50 km radius of the 363-year-old building. 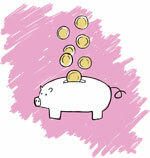 Availability of LPG is not the only issue. “Making petha with LPG costs Rs 5-6 more per kg. It is an inexpensive sweet; a simple preparation costs Rs 40-50 per kg. Sales of those manufacturers who increased the price dipped,” says Yadav of the union. ADA has a rehabilitation plan for the petha makers but that hardly addresses their problems. The civic authority has set up a Petha Nagari at Kalindi Vihar, some 18 km from the Taj Mahal. It has 156 plots, of which 92 have been sold, and 20-odd units have shifted there. “Even if all plots are taken, what will happen to the remaining 850 units?” asks Yadav. Kalindi Vihar does not even have a gas connection, which was the primary reason petha manufacturers were asked to shift in the first place. “I shifted here five years ago after the government promised LPG pipeline. That has still not happened. I have to make petha at a high cost and pay extra for transport,” complains Pradeep Kumar, owner of Om Sai Petha Udyog. Their union has submitted memorandums to the state government for cheap fuel. The site does not fulfil one primary need of petha-making—sweet water. The water in the area is salty. Pethas made in the area are not considered tasty. “We are working to bring quality water and LPG pipeline to Petha Nagari,” says an ADA official, requesting not to be named. March 31, 1994 | Uttar Pradesh asked to submit list of units in TTZ for relocation. December 2017 | While observing the ad hoc measures are not enough, the apex court directed the UP government to prepare a comprehensive vision document to protect the 17th centure mausoleum. June 2018 | Union minister for culture and environment implemented the 'Taj Mahal Declaration to Beat Plastic Pollution' and made residents staying in 500-metre radius of the monument pledge to reduce use and litter of single-use plastic.